The town of Virden is under a boil water advisory after a major water main break in the community Tuesday night. Residents are advised to boil water for at least one minute for drinking and ice making, preparing beverages (including baby formula), brushing their teeth and preparing food, including washing fruits and vegetables. Virden’s four schools are closed today as a result until the break can be fixed. The Liberals have nominated Floyd Buhler as their candidate in the Arthur-Virden byelection later this month. The Kenton, Manitoba resident is currently a safety advisor with the Manitoba Heavy Construction Association. “Arthur-Virden is a constituency full of possibilities and potential where the people of the region are hard-working, innovative and resourceful,” Buhler said in a release. Buhler is married with two children and sees the need for more development in his region to create a sustainable economy for the next generation, he said. The byelection to replace former MLA Larry Maguire is scheduled for January 28. A byelection in Morris to replace former MLA Mavis Taillieu will be held the same day. Drivers in Western Manitoba are being urged to be extra cautious on the roads today, as RCMP report ice-covered and slippery conditions. Two minor collisions occurred in the Virden area on Friday with the first appearance of winter-like driving in the province. The RCMP is advising motorists to adjust their driving for the weather conditions by reducing their speed and increasing their distance between other vehicles. Emergency response times may also be delayed given the road conditions. To check the highways before venturing out, visit MB511.ca. Environment Canada is calling for periods of light snow in Winnipeg this afternoon and into Saturday. A 50-year-old man from the RM of Wallace was killed Monday after a two-vehicle snowmobile crash west of Virden. RCMP say the crash happened just after 2 p.m. adjacent to the Trans-Canada Highway. According to police, a male snowmobiler had become stuck when another was hit by an oncoming snowmobile while attempting to help. The injured man was taken to hospital where he was pronounced deceased. No other injuries were reported and police continue to investigate. A fire that destroyed a hardware store in Virden last Saturday has been contributed to arson. The fire broke out just after 3:30 a.m. and also damaged a four-unit residence behind the business as well as a building beside the store. Damage estimates are expected to be in excess of $2.5 million. No one was injured in the fire and police continue to investigate. 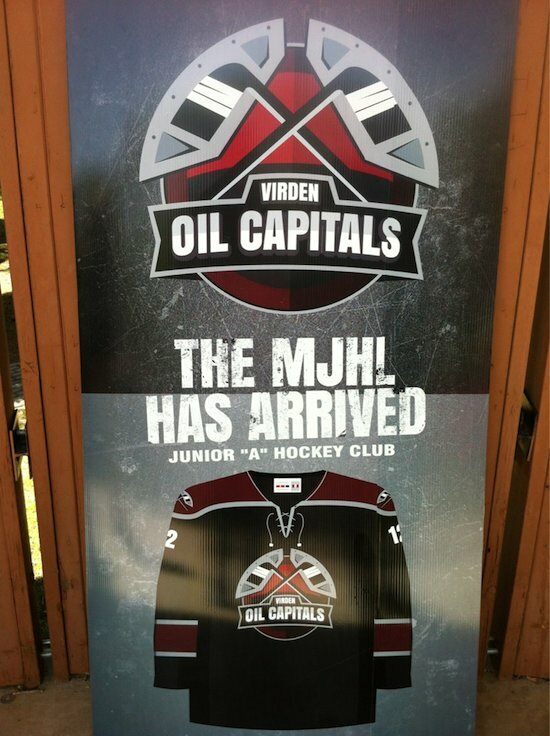 Virden’s new Manitoba Junior Hockey League team will be known as the Virden Oil Capitals. Town Mayor Jeff McConnell tweeted the name Wednesday. The name replaces the Winnipeg Saints, which had its franchise moved to Virden recently. The Oil Capitals will play in the 2012-13 MJHL season. The Oil Capitals will start their season ticket drive on May 25 and hope to sell 500 tickets. The drive will coincide with spring camp. The eastbound lanes of the Trans-Canada Highway — about 2.5 kilometres east of Virden, Manitoba — are shutdown after a semi-trailer truck rolled Friday morning. Traffic is currently being re-routed to the westbound lanes while crews clear the scene, which is expected to take several hours. Traffic is currently blocked from Highway 257 to Highway 254. No other vehicles were involved in the collision and no one was injured. RCMP are advising motorists to use caution on the roads after police responded to several minor collisions and vehicles in the ditch. Virden will play host to the 2012 TELUS Cup West Regional qualifying championship, Hockey Manitoba announced Wednesday. The championship March 29 to April 1, 2012 will be hosted by the Southwest Cougars of the Manitoba Midget Hockey League (Midget AAA). The qualifying event annually features a host team along with the provincial champions from Manitoba and Saskatchewan as well as the Northwestern Ontario champion. The winner of the West Regional then advances into the TELUS Cup to contend for a National Midget Championship.